Whole Roasted Cauliflower aka the BEST cauliflower ever. 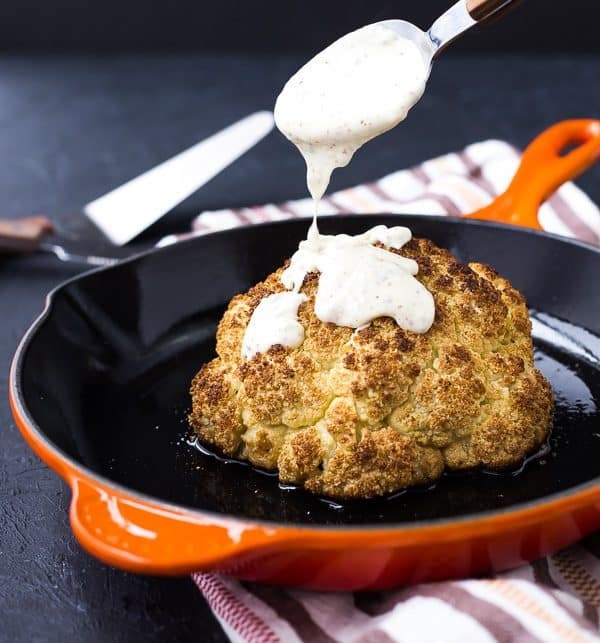 Smothered with a creamy dijon sauce, you’re never going to look at cauliflower the same. You guys, this is literally THE BEST CAULIFLOWER I have ever made or eaten. That sounds like a bold claim, but I’m telling ya, it’s true. A couple of months ago, I went to Napa Valley for the Food and Culinary Professionals Workshop with Rachel Cooks’ partner Milk Means More. In addition to learning how cheese is made, we also attended a couple sessions on up and coming food trends. I found these fascinating and I can’t wait to share lots of recipes within these food trends. I’m not always the quickest person to adopt fashion trends (okay, probably one of the slowest), BUT when we’re talking about food, it’s an entirely different story. 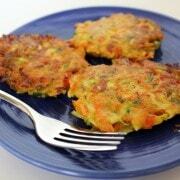 Especially when one of the trends is vegetable-centric recipes. Vegetables and I go way back and we’re pretty tight. I’m all about making them the star of the show and could easily make a meal out of a pan of roasted vegetables with a sprinkle of feta and a drizzle of something delicious like honey mustard vinaigrette or a homemade pesto. When I heard that this is an actual trend, my ears perked up. We’re talking about meals and menu items that place a vegetable or vegetables as the STAR of the show, and then use meat as an accent – a sprinkle of bacon or a crumble of chorizo. Restaurant menus are putting a “vegetable” category front and center on their menu instead of a small font “sides” list at the bottom of the menu. I, for one, am very excited about this. I took this as inspiration for this recipe. The vegetable is definitely the star here, and I could easily make a meal out of this alone. If you haven’t tried roasting a whole cauliflower, I’m going to insist that you do. Your house will smell like cauliflower big time, but light a candle and deal with it, because it’s so worth it! 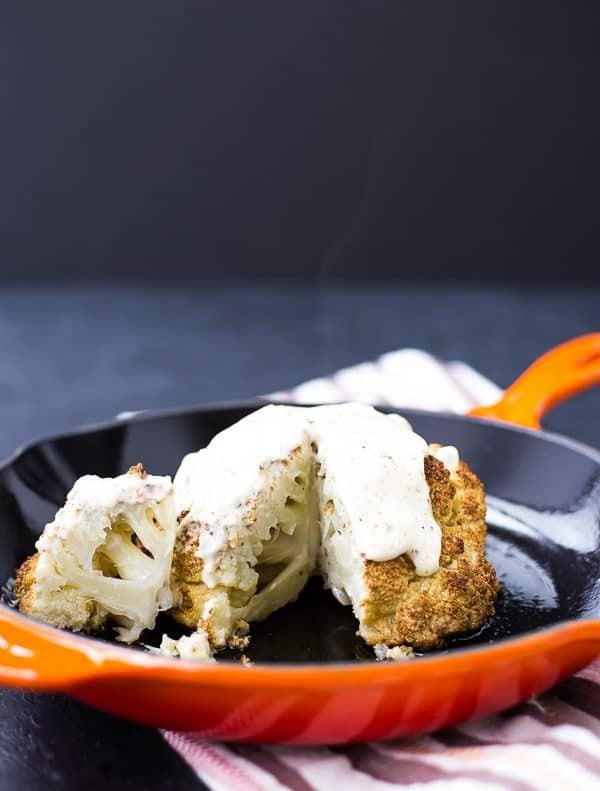 The outside of the head of cauliflower gets irresistibly crispy and then the inside is soft and practically melts in your mouth. I’m craving it, just from writing about it. This sauce. 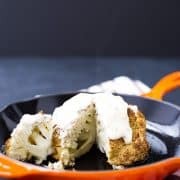 It may not be the prettiest thing, but the creaminess of the butter and cream with the sharp flavor of the Dijon mustard is something dreams are made of. Did I tell you I ate HALF of this whole roasted cauliflower in one sitting? I’m not even the slightest bit embarrassed because I know once you try it, you’ll do the exact same thing. Preheat oven to 375 degrees Fahrenheit. Wash cauliflower head and pat dry. Trim away leaves and thick woody part of stem, being careful to leave the head of cauliflower intact. 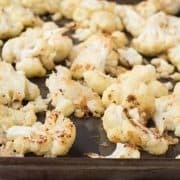 Drizzle olive oil over the entire head of cauliflower (top, sides, and bottom) and rub it with your hands to fully coat. Sprinkle with salt and pepper. Place in baking dish or cast iron pan and cover tightly with foil. Bake covered for 30 minutes. Uncover and bake for another 45 minutes or until fork tender. 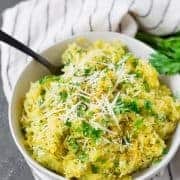 Start this when cauliflower is almost done cooking, it doesn’t take long to make! In a small saucepan over medium heat, whisk together cream, Dijon mustard, flour, chives, and salt. Heat, stirring constantly, until thickened, about 5 minutes. Remove from heat and whisk in butter until melted. 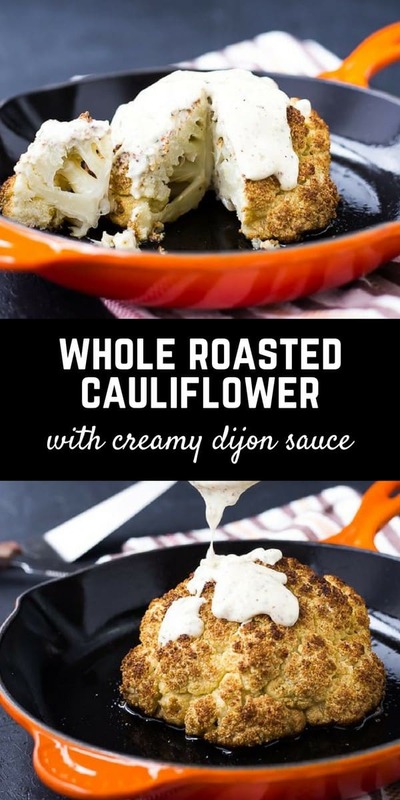 Pour sauce over the entire cauliflower or over slices immediately prior to serving. Note: You may use half & half instead of cream in the sauce if desired. Verdict: If you don’t know how I feel about this whole roasted cauliflower recipe by this point, you weren’t reading anything I wrote. Which is cool, I know you’re busy! Cliff’s note version: I’m obsessed. Husband’s take: He wasn’t quite as passionately in love with it as I am, but he did say it was the best cauliflower he’s ever tasted. I think. Or maybe that was just me saying it on repeat. I can’t really remember, my memory is clouded by creamy Dijon sauce. Changes I would make: None! A sprinkle of fresh chives would make this prettier in hindsight. If you’re serving it for guests or friends, you might want to consider garnishing it that way. 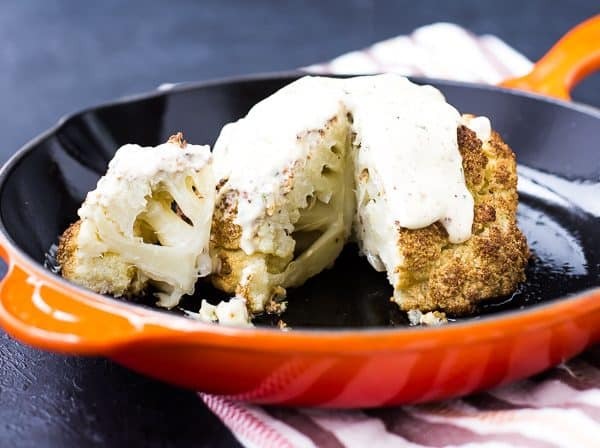 Disclosure: I have been compensated by Milk Means More for my time to develop this whole roasted cauliflower recipe and write this post. All opinions are as always, my own. Find out more about why Milk Means More on Twitter, Facebook, YouTube, Instagram and Pinterest. I would love to make this unique dish for a company party this Wednesday, so do you have any suggestions on preparing it in a way that you don’t have to serve it right away (I.e. crockpot, adding more cream to the sauce before it’s served, cutting it up that morning to where people can nuke it, etc)? Thanks! I’m making it for my family no matter what btw! I’m not sure this one would be good for not serving right away. The texture would change and the cauliflower would possibly get a little mushy. If you did anything, I’d cut it up and microwave it but it’s probably not the best recipe for that kind of situation. But I hope your family loves it! Your post has convinced me I have to stop putting off trying this! It looks delicious and love your description of the crispy outside and creamy melt in your mouth inside! I hope you love it as much as we do, Shelby!